Northern Tablelands MP Adam Marshall talks teaching with Moree mum and Aussie Kids pre-school teacher Lidia Mathews to toast her scholarship success. MOREE preschool teacher Lidia Mathews has been awarded a $10,000 scholarship to help build on her qualifications in early childhood education. Mrs Mathews already has two diplomas but the news she’s won the scholarship means her path of study for a bachelor’s degree is that much easier, financially, to upgrade her qualifications. 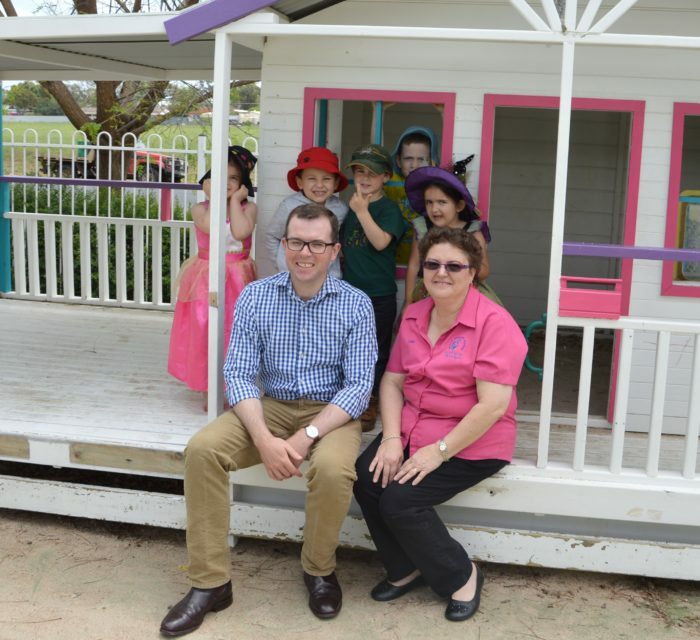 Northern Tablelands MP Adam Marshall delivered the good news to Mrs Mathews this week at her workplace Aussie Kids of Moree, a pre-school, long day care and out-of-school-care centre in Amaroo Drive, where she’s worked for 18 months. “It’s very important for anyone to get a scholarship especially when you’re trying to work as well,” the Moree mum of grown up children said. She wasn’t able to go to university when she was younger but the scholarship is helping her achieve another stepping stone to build on her qualifications. “I’m just really glad to get this scholarship; it’s blown me away,” Mrs Mathews said. Mr Marshall said Lidia had already begun her online fulltime four-year degree, juggling a virtual fulltime job with a day’s study leave and family commitments. Mr Marshall has congratulated Mrs Mathews on the scholarship coup, saying diploma-qualified early educators were the first beneficiaries of his government’s commitment to strengthen early childhood education for children in rural and remote communities. He said Lidia’s scholarship award is part of the NSW Government $80 million education blueprint for action program, and are specifically for those working in regional, rural and remote areas, outside of the big cities. Aussie Kids centre owner-operator Sally Huggins said Lidia’s pursuit of further qualifications was not just a personal win, but would also benefit the children and the centre’s ability to offer higher quality teaching. There are 14 staff at the centre, which is licensed for 67 places, with one degree-qualified teacher and now two undertaking their degree studies.